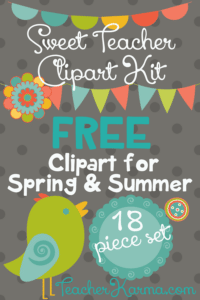 This FREE Sweet Teacher Clipart Kit is for you teachers that are excited about the arrival of SUMMER. Yea!! I wanted to create a graphics freebie for teachers to inspire them to create something special. These graphics are just perfect for your Spring, Summer, or ANY DAY… educational resources and classroom decor.